Not much to brag about at the pea patch right now. Snow peas are done, fava beans distant history. We got our ten strawberries for the year. And owing to a cool, rainy June it’s still weeks before summer’s first beans, squash, and tomatoes. 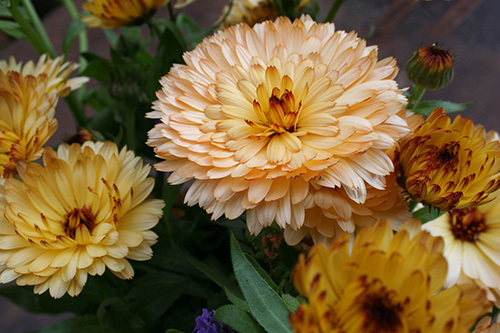 Yet these rogue flowers from another gardener’s seed spill — calendulas possibly? — are producing like a dream. We don’t eat them, of course, but a jar of blossoms on the table sure makes everything else taste better.